So it seems only right that the first post about the wonderful local stock we are serving, features the first supplier who walked in to the pub when it was still shut. 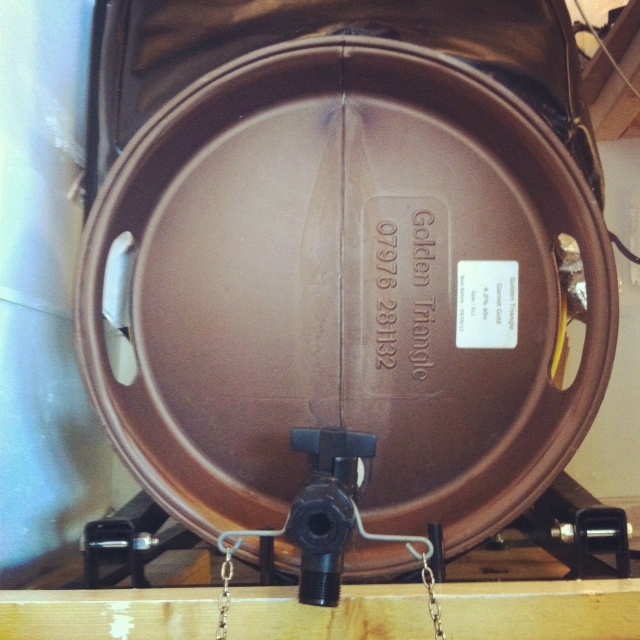 The Golden Triangle Brewery has become one of our most popular choices for ale at the moment….possibly because we have been lucky enough to have our very own “Garnet Gold” ale on the tilts! Kevin, the owner of the brewery, is often sitting in the pub now quaffing his creation. I decided to pick his brains over what on earth made him set up his brewery and here was his response…..
“I suppose it began on 1st February 2009 , a Saturday morning in my kitchen. My house is in an area of Norwich that is known as “The Golden Triangle”, (probably a name invented by estate agents!). A friend of mine and I were having a coffee on Saturday ( after a a few too many beers on the Friday night ! ). We were talking about what we would each call an imagined brewery business of our own and that’s when I first thought of using the name Golden Triangle. The next day I registered www.goldentrianglebrewery.co.uk as I was still thinking about it and just thought….well if dont do it someone else will. That, of course, planted the seed of the idea of the brewery and I next bought a Woodfordes Wherry beer kit and stated brewing my first ever beer. I would absolutely recommend the Brewlab week course to anyone considering trying this. Better decisions mean less expensive mistakes, and I met a great bunch of fellows on it. My passion was for brewing the kind of pale hoppy beer that I like, and no-one in Norwich seemed to be brewing at that time (and still are not!). My “City Pale” was featured in this years City of Ale festival, and my new 4% ale known as Garnet Gold seems to be selling well! I hope you don’t mind if we borrow that motto off you Kevin!